ASML's Architects is the first full history of ASML's bumpy road, from the early lithography research at Philips Research in the 60s to ASML's public offering in 1995. In the 1980s the American heavyweights Perkin-Elmer and GCA came under incredible fire from their Japanese competitors Canon and Nikon in the chip lithography market. As a result, the US lost its two-decade monopoly on this key technology, which is the driving force behind Moore’s law. Meanwhile, an obscure, inconsequential lithography company in the Netherlands was taking its first steps. This company, ASML, is now an unparalleled success. It is the world’s biggest and most profitable machinery manufacturer for the chipmaking industry. With a market share of 70 to 80 percent, ASML has been leaving Canon and Nikon in the lithographic dust for years. 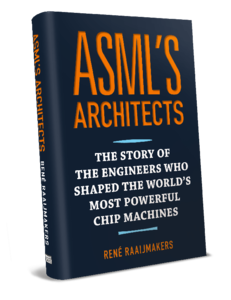 In ASML’s Architects René Raaijmakers returns to the birthplace of the wafer stepper and the roots of ASML’s stunning global success. He chronicles the engineers’ all-consuming race to surpass the rest, providing a vivid window into the unique culture that spawned the world’s finest chipmaking technology: the all-or-nothing, go-for-the-gold mindset that still permeates ASML. Please take a look at the introduction and some chapters from ASML’s Architects at the tab above named Extra's. Or click on Reviews to explore some reviews by readers. Or read the full review by Mike Maynard from Napier.